When you imagine the mouth-watering flavor of a sweet, juicy pineapple, it is difficult not to conjure up images of hula dancers in grass skirts and endless miles of sandy beaches surrounding the lush, verdant tropical paradise of Hawaii. 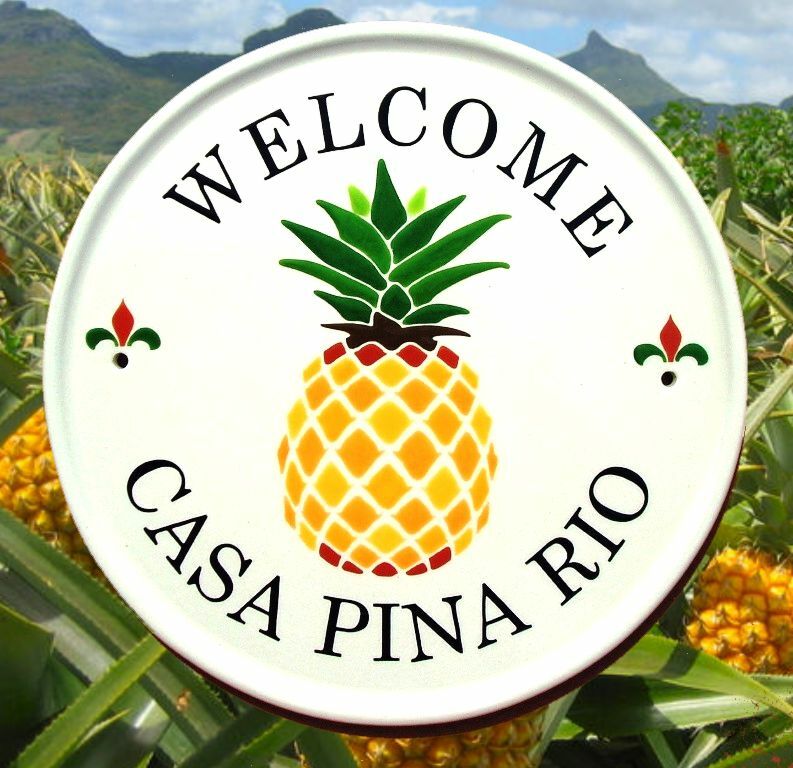 As winter morphs into spring and the rays of hope and sunny days break through gray and cloudy Oregon skies, Classy Plaques invites you to join us and dream of the warm, gentle tropical breezes of Hawaii as we feature our Hawaiian Pineapple Address Plaque in this post. Hawaii and pineapples go together like… well Hawaii and pineapple! Imagine a ceramic address plaque or a sandblasted house number sign greeting you and your visitors with a sweet and fragrant reminder of tropical paradise every time they visit your home. For those of you with culinary abilities (and the rest of us who enjoy eating what you create), pineapple is a favorite in the kitchen. A site search for pineapple on Cooks.com returns 800 pineapple recipe titles and over 5,400 recipes that call for pineapple as an ingredient. Is anybody else getting hungry? Green leaves and a firm body are the best indicators of a ripe pineapple. It’s not the size or the color. A large pineapple in not necessarily riper or sweeter than a small one and a pineapple that is green on the outside can still be ripe on the inside. It’s best to eat your pineapple quickly after purchase as it won’t become sweeter or riper after it is picked. If you do need to store it for a few days, keep it in the refrigerator to preserve freshness. Though the pineapple originated in South America (Paraguay and Brazil), Hawaiian pineapple plantations grow nearly one-third of the world’s pineapple crop and produce almost two-thirds of all canned pineapple products - not bad for the 8th smallest state in the country. • Pineapples are high in vitamin C, fat-free, cholesterol-free, and low in sodium. • Fresh pineapple contains a protelytic enzyme that breaks down protein in a manner much like digestion. • Fresh pineapple in meat marinade adds great flavor and tenderizes the meat. • A pineapple address plaque from Classy Plaques may be a perfect gift for someone you know!